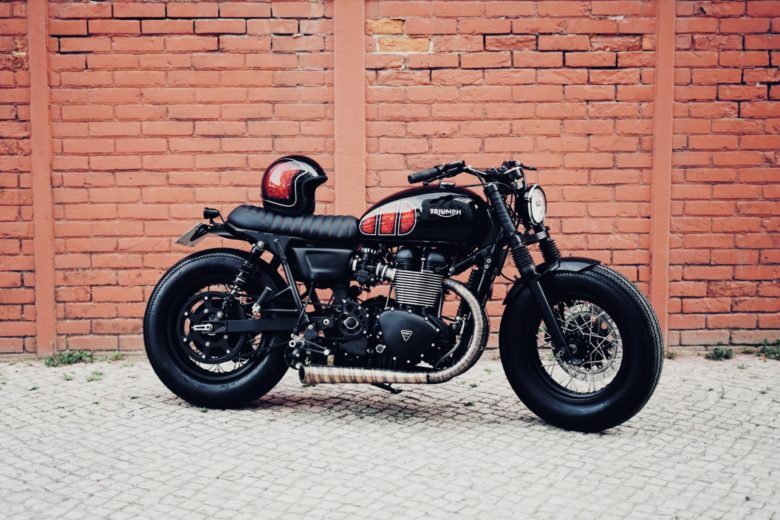 Why are there hardly any Triumphs on this blog? 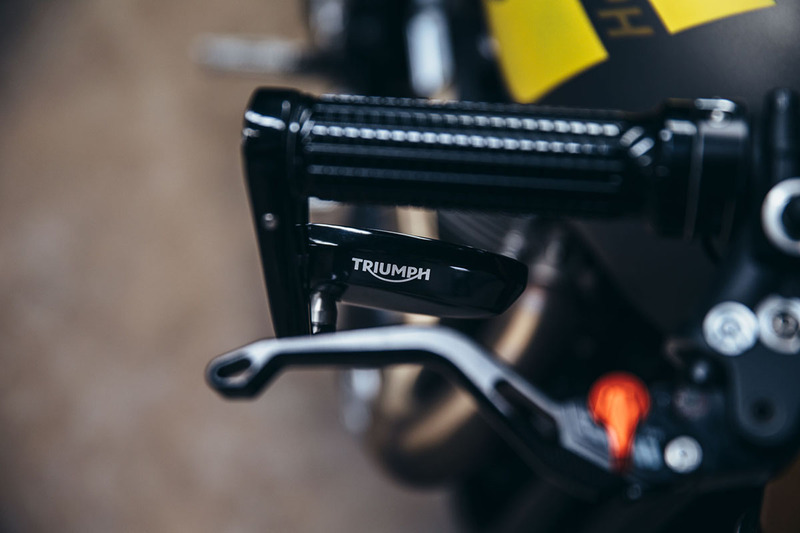 I have a theory… I simply like Triumph as a brand, they meet my taste with their product range (not only the retro bikes but also the modern ones, like Speed / Street Triple or the Rocket). Therefore I don’t see any radical possibilities to improve any of their retro looks. 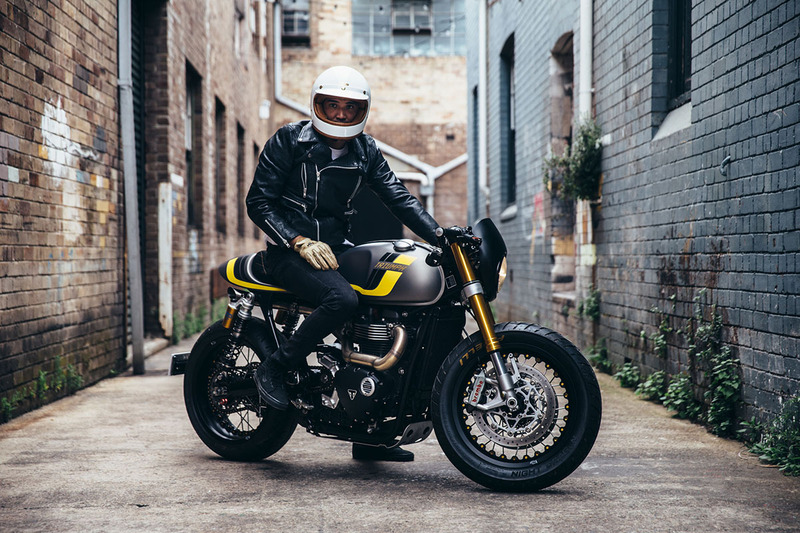 There is not much room for customization – especially considering the Thruxton! 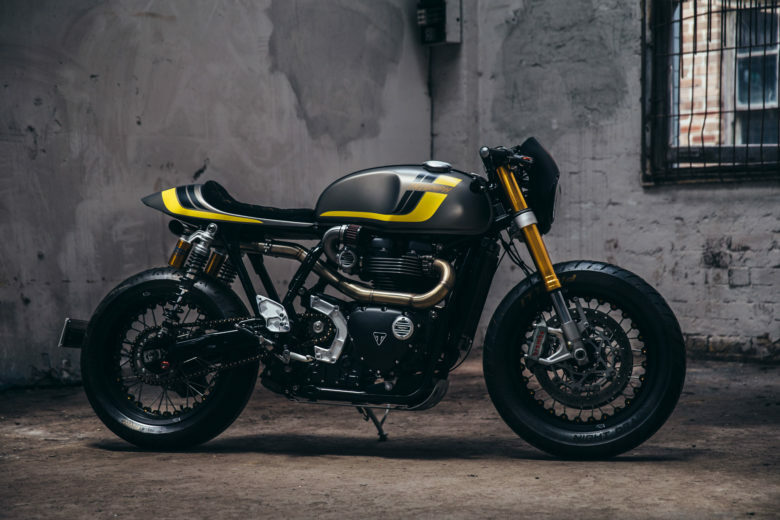 But with this particular Thruxton R… Usually, I read the blogs, magazines, follow the workshop pages – browsing for a new project to feature here. I like this process, as it just comes natural – when I click on some miniature or browse the details of an article – I know I’m hooked, and that it’s just enough reason to write about what grabbed my attention. I collect links and photos and then choose from them. Simple as that. So I was very happy to finally meet a modified Triumph, that seemed a major improvement of a base that is very good looking as stock. 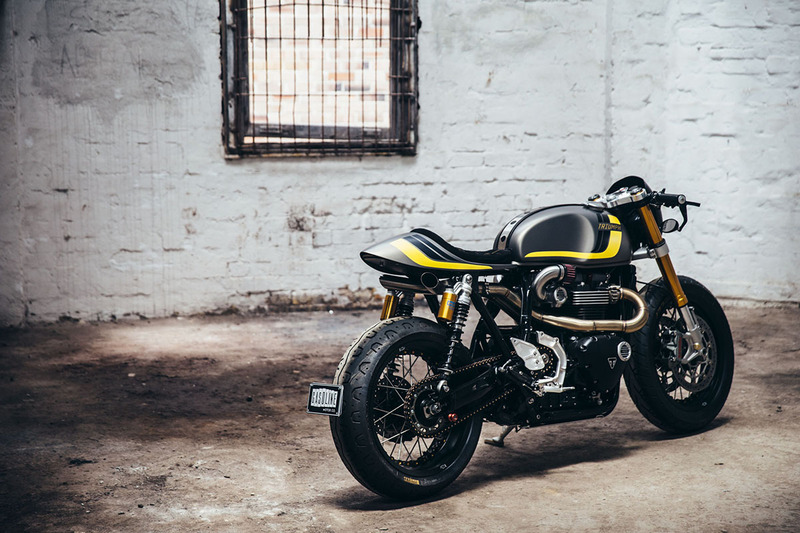 The quote from the builder I read somewhere… Thruxton is the “original” cafe racer. 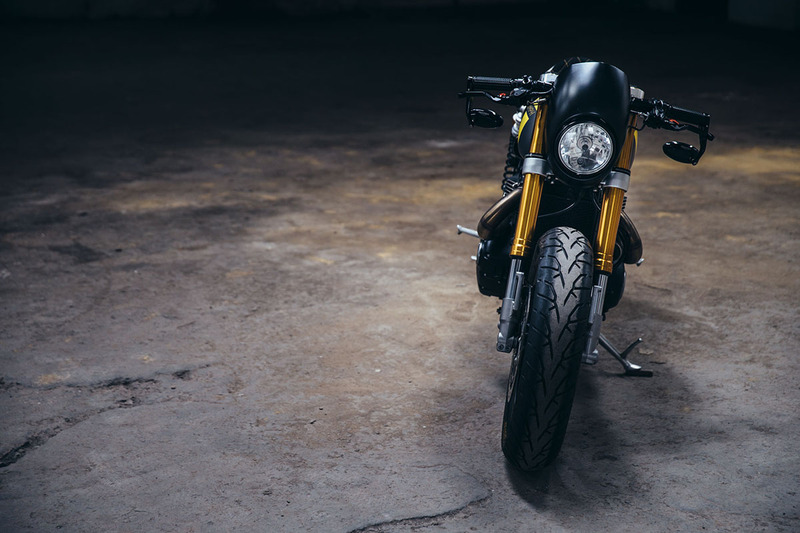 The most honest and true reincarnation of an old cafe racer bike on the market. And it was the donor bike that Wenley Andrews decided to “reimagine” and improve. Since the Thruxton R is a top of the street bike range from Triumph – the improvements required extra effort. 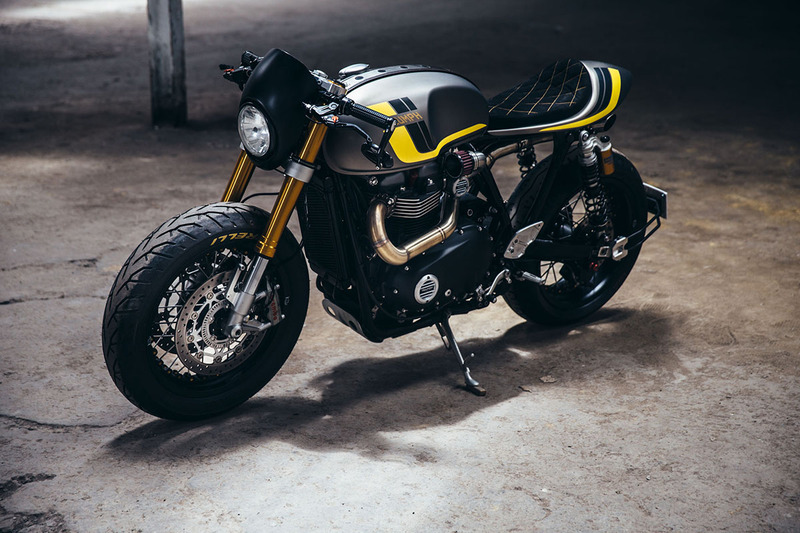 Stock Thruxton version is very good looking – the changes made here are not visible much. The tank is stock, the seat was made narrower and smaller in size. Wenley went for a satin finish with some racing stripes. That’s it. 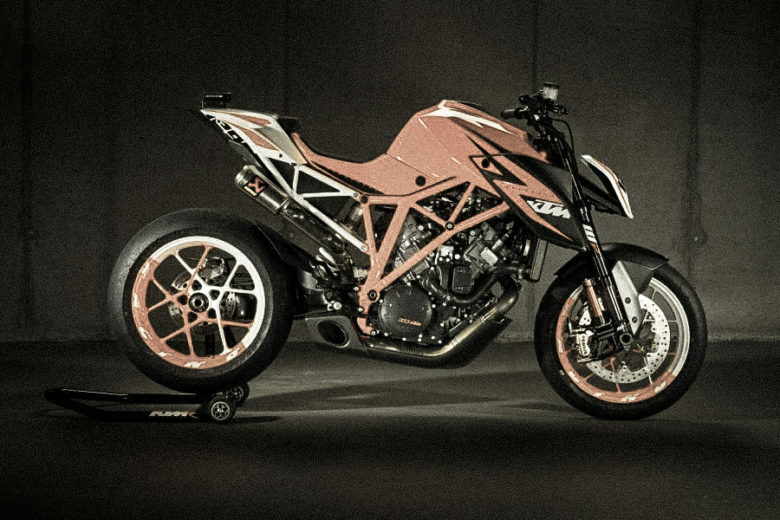 The performance – the original engine is sufficient to push this bike forward. So the upgrades had to be made elsewhere. The main idea for exhaust was to make it loud. What You see there is actually no visible mufflers, just the pipes running under the seat – I believe that it makes a statement on the road. 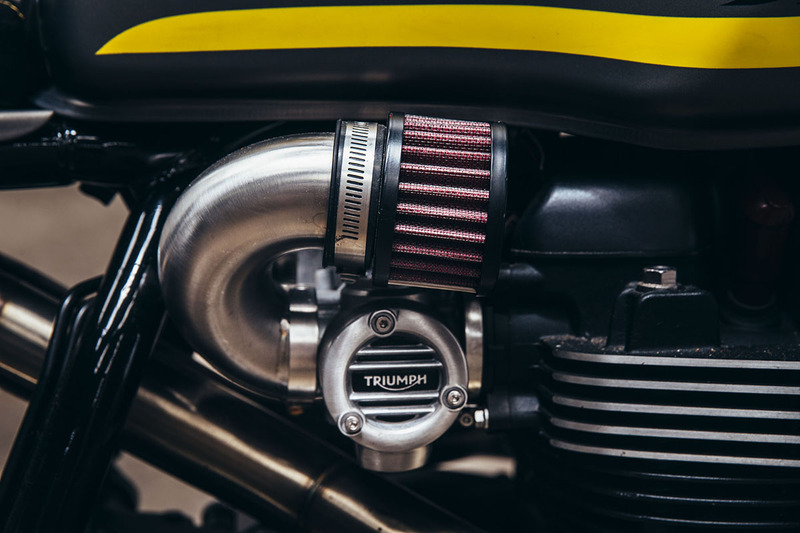 The pipes required the intake to be modified to an extent – that not even pod filters would fit behind the engine. So this is why You see these snakelike velocity stacks with small filters on the sides. The suspension of Thruxton R is top notch. 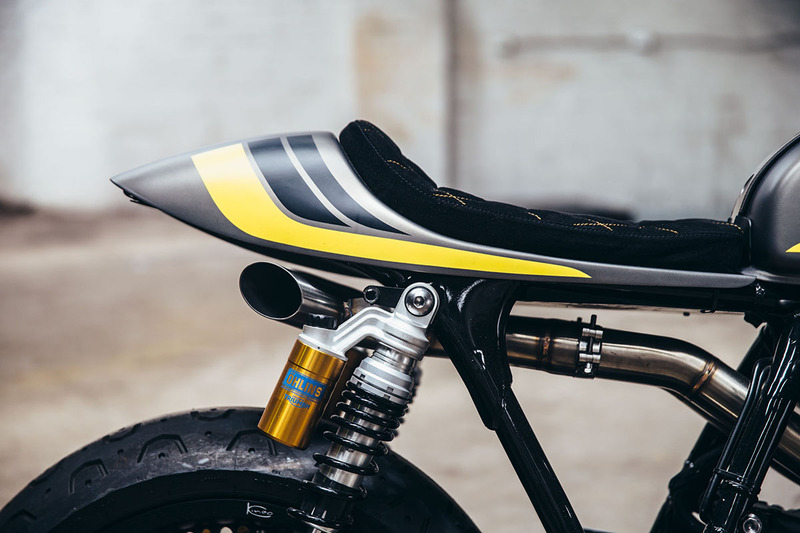 So only the aesthetics were changed: Wenley painted the rear springs and modified the upper clamp – to accommodate the small Motogadget speedo. The forks stayed stock. The big focus point should be the Kineo wheels. They offer cool option to configure the sizes, paint, spokes, hub, materials and colors. And this build is running 17-inch spoked versions… with monstrous 180 rear tire, that makes this bike look even more muscular. Other electric accessories like m-blaze signals, switches, grips etc also came from Motogadget product range. 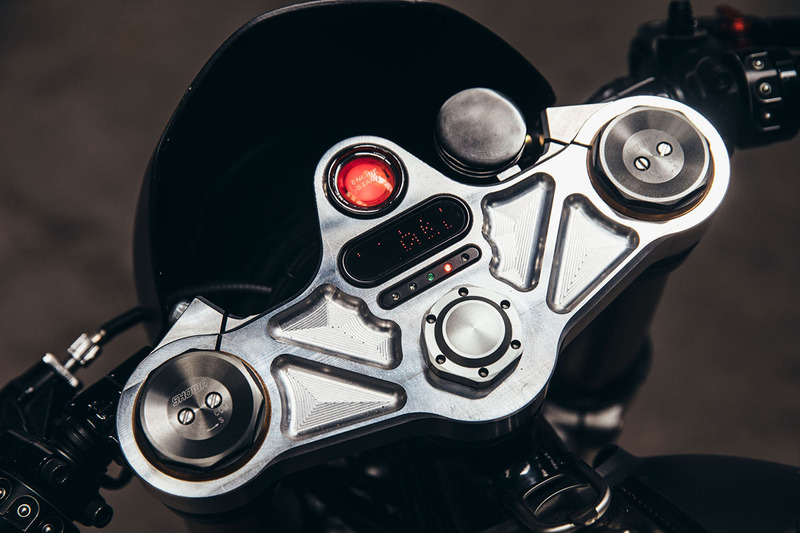 Therefore the controls and handlebars look very tidy… Speaking of the front end – I wonder – would this build work better with some more classic cafe racer fairing? Is the one installed the best possible choice? Let me know what You think about it.